Selika Ducksworth-Lawton compares herself to church ladies and deacons. She is an organizer and a doer, much like those who ensure there’s food on tables and tissues are within reach at a memorial service. Skilled in logistics, she often finds herself involved with crisis management, both in preparation and in response. A historian and history professor at UW-Eau Claire for the past 24 years, Ducksworth-Lawton specializes in military and civil rights history. She earned her Ph.D. from Ohio State University while studying African American military history. Her research has taken many turns throughout her life, and now focuses on the Deacons for Defense and Justice, a civil rights militia group that defended against the Klu Klux Klan in the late 1800s, for a book she is publishing in fall 2018. She places a high value on “doing.” She often finds herself calling for action when her collaborators are caught up in talk and theory. “I’m the one sitting here going, ‘We’ve been talking about this for 20 years, can we DO something?’” she said. Ducksworth-Lawton considers herself a “Red Letter Christian.” The words of Jesus Christ from the Bible are the heart of her faith, and all other parts of the book and religion are “commentary.” Matthew 25:40, where Jesus says, “Truly, I say to you, as you did it to one of the least of these my brothers, you did it to me,” informs her actions and outlook. Playing to her strengths, she works toward a healthier community by educating. She employs strategies from the academic discipline of “Public History,” which is the practice of publicizing historical information in order to empower society. She does so by acting as a consultant for various community organizations, using a historical lens and her own personal experience to lend expertise in various areas. 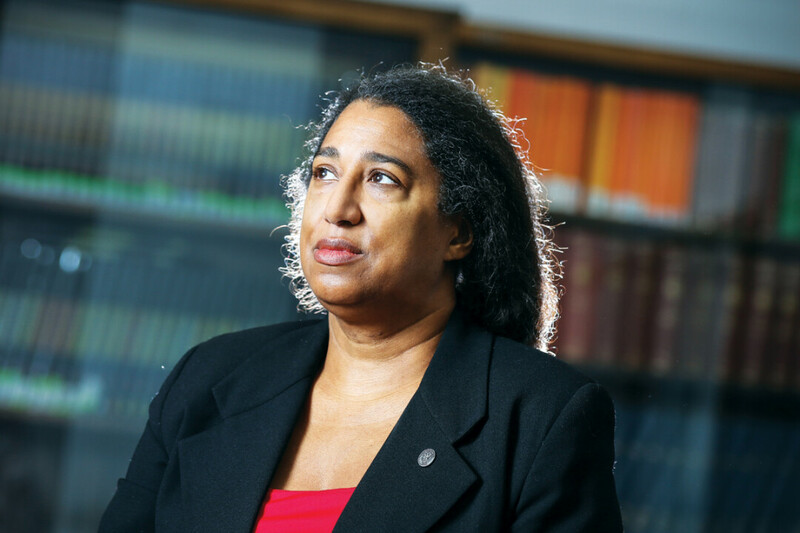 Ducksworth-Lawton advises the Eau Claire Police Department in the handling of cases involving racial factors, as well as in training the force against racial biases. She is involved with implementing active shooter training programs at UWEC, and is beginning to collaborate with the Eau Claire Area School District to devise training concerning racial issues. Besides consulting, she volunteers her time to organizing the Eau Claire Martin Luther King Jr. Day and Juneteenth observances. She is involved with the Madison-based SheRock camp, which educates women in music and fundraises for a girl’s youth music camp, and was elected as a board member of the Chippewa Valley ACLU in November. She helped with the marketing efforts for the Eau Claire Women’s March, acted as the African American History Month director for several years, and performed as a musician at a recent Midwest Feminist fundraiser. Ducksworth-Lawton follows the teachings of Martin Luther King Jr., espousing the value of nonviolence in political action. However, she believes the option to be nonviolent is best protected by the ability to defend oneself. Her research has shown that armed groups, public and private, were essential to the civil rights movement, both in protecting against terror groups and in ensuring safety for nonviolent protesters. “To discuss armed defense in the Civil Rights movement, we had to wait for some people to retire,” she said. Academia periodically finds itself wrapped in consensus, she explained, which sometimes makes it difficult to research and publish new perspectives. She faces barriers in academia due to the nature of her studies and due to her race and gender. Other scholars and administrators of various social and political philosophies sometimes claim that her beliefs and research are incompatible with being a black woman. This and other forms of stereotyping create difficulties and occasionally eliminate opportunity for her. Though she continues to assist in community efforts, an August 2016 breast cancer diagnosis has encouraged Ducksworth-Lawton to slow down. She continued to teach and volunteer through a cycle of radiation treatment, learning who she could rely on for help, and where she could step back. “I do fewer things, but I try to do them more deeply,” she said. Ducksworth-Lawton wears a pin on her lapel that reads “Eagle Scout Mom.” Her son recently earned the rank of Eagle Scout within the Boy Scouts, a process that requires years of work and culminates in a community service project. Her daughter is in the Girl Scouts, and Selika has volunteered in both organizations throughout their involvement. The original version of this article said that the SheRock music camp was in Minneapolis. It has been corrected to reflect the camp's actual location in Madison.